Mexican designer Fernando Laposee's latest work is a refreshing collection of home products made from a subtropical fruit called Lufa. A graduate from London's Central St. Martins, Laposee has created a beautiful collection of objects that take advantage of the lightness, translucency, heat insulation, texture, and shock absorptive qualities of the dried fruits. 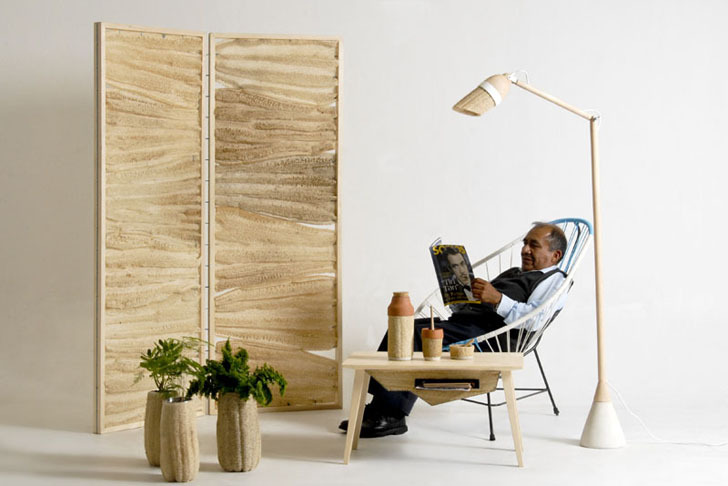 Click through our gallery to discover a room divider, a lamp, a desk, a hot chocolate set, and a series of plant pots made from the biodegradable material. Lufa (or Loofah) is a tropical vine that contains a network of xylem fibers commonly used to create natural bath products like sponges. The vine belongs to the Cucurbitaceae family, (like squashes, melons and pumpkins), and the fruits can be eaten as fruits — popular in Asia and Africa — or dried to make products. Mexican designer Fernando Laposee has created a collection of household items that make good use of the sponge-like tropical fruit. He created a fantastic room divider for adding some flexibility to interior spaces. Freestanding and flat-pack, this object was created by cutting and sewing flat pieces of Lufa to a wooden screen. Laposee also celebrates the fruit’s texture in a desk, where it creates a harmonious contrast with the stark steel that surrounds it. The combination of Lufa and terra-cotta in Laposee’s hot-chocolate set is also delightful – we love how the natural materials create visual contrast while taking advantage of the fruit’s insulation properties. It is impressive of this kind of green room divider, creative and special. But it will last for a long time? I mean, can it be used for a long time without the worry of the quality of materials going bad? Lufa (or Loofah) is a tropical vine that contains a network of xylem fibers commonly used to create natural bath products like sponges. The vine belongs to the Cucurbitaceae family, (like squashes, melons and pumpkins). 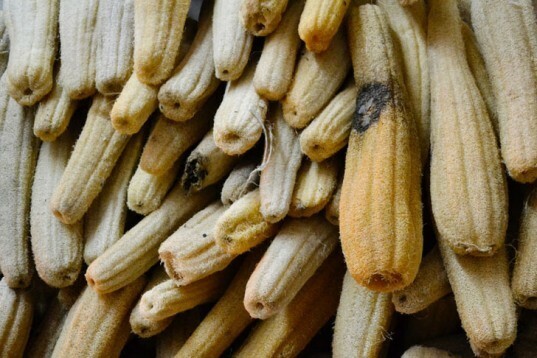 The fruits can be eaten as fruits -- popular in Asia and Africa -- or dried to make products. Mexican designer Fernando Laposee has created a collection of household items that make good use of the sponge-like tropical fruit. He created a fantastic room divider for adding some flexibility to interior spaces. Freestanding and flat-pack, this object was created by cutting and sewing flat pieces of Lufa to a wooden screen. Lamposee also incorporated lufas into his design for an elegant wooden lamp. It emphasises the dry fruit's translucency by diffusing a brilliant soft light. 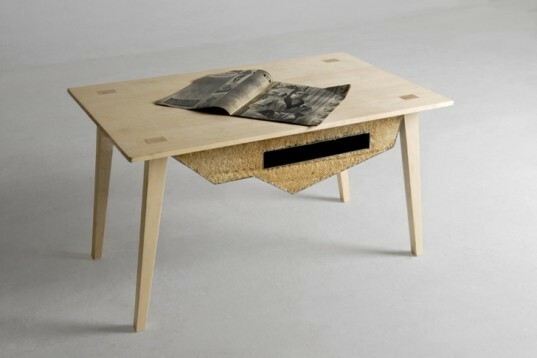 Laposee's desk is also simple in its design and is entirely made from wood, steel and Lufa. The fruits' texture is featured under the desk, where it creates a harmonious contrast with the stark steel that surrounds it. The combination of Lufa and terra-cotta in Laposee's hot-chocolate set is also delightful. We love how the natural materials create visual contrast while taking advantage of the fruit's insulation properties. Plant pots covered from the entire dried fruits look rough yet stylish. Laposee's Lufa Series is a beautifully clever collection of objects based on a dried tropical fruit and a refreshing take on sustainable design.